This deck has gotten me over 4000 trophies and is a really strong deck. This is a versatile deck with no extreme counters. This deck is very strong in many situations in the current meta. There is no specific deck that counters this deck and this deck is guaranteed to win around 80% of the time. Losing with this deck is a result of misplays and simply not effective with your elixir. This is a 2.8 deck so it cycles really fast. To deal with minion hordes and barbs, use fire spirits to take care of them. To deal with elite barbs, place ice spirit to the side to drag and freeze both elite barbs then use fire spirits to clear them. At it’s worst, this defense combo will only let a single elite barb get 1 swing before dying. This is a 3 elixir defense so it results in a positive elixir trade. When facing hog riders you can simply tornado it into the king tower. The main focus of this deck is to use the royal giant to do as much damage as it possibly can. To make sure this happens you could always either just place it at the bridge to get damage in, or place after you use the executioner tornado combo then place royal giant for a counter push. When playing against an inferno tower, always try to predict the tower with minions, otherwise use your zap to stun it. This deck is great against zap baits as you have zap, double spirits and executioner not to mention mirror. The mirror can be used in many situations to surprise your opponent. 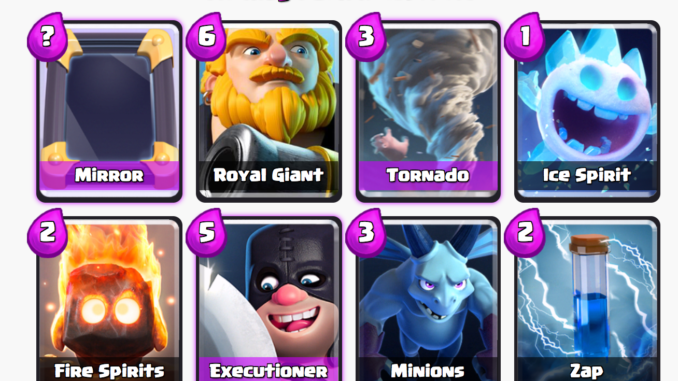 Having a double zap or minions or even royal giant is effective as your opponent considers those cards to be out of rotation after they deal with it. This deck doesn’t have a major downside. The 2 cards that this deck has trouble with shutting down fast is royal giant and golem. The best way to deal with them is to simply try to defend against them with executioner and minions. This deck does not have a building due to its offensive nature so try to play a little safe.